Speed limit is 5 MPH for the safety of others. No Smoking in shower rooms as per the law. Pets are allowed, however they must be kept on a short leash and be cleaned up after. No pets in the shower room. Barking dogs will not be tolerated and will terminate your stay with loss of your camping fee. It is the owner's responsibility to control their pets and they cannot be left unattended. No washing or repairing of any vehicles. No parking or blocking of empty sites. One site per camper. Please refrain from parking vehicles on the grass. Quiet time is in effect between 10:00 pm and 7:00 am. Please be considerate of others. Campfires are only allowed in burning rings and must be kept to a minimum. Fires must be always attended to and extinguished upon returning or leaving the campsite. Garbage is to be placed in the dumpster and your site left clean upon leaving. Parents are responsible for their children at all times while staying here. 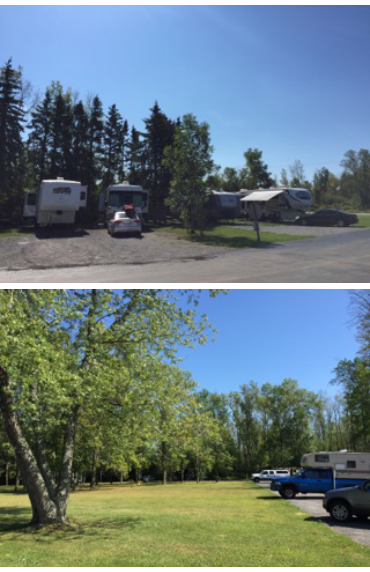 Campground is not responsible for lost, stolen or damaged articles or vehicles as well as any personal injuries. Your stay may be terminated without refund if any of the park rules are violated.